As the name implies stone fruits are fruits that contain large, to them, stones/seeds. Fruits like peaches, nectarines, plums, apricots and even cherries are considered stone fruits. Native to warm climates the fruits are at their peak from June-September and be used in a variety of recipes, both sweet and savory. Check out the recipe round-up below. Once again I am filling in as part of this month's Progressive Eats Dinner Party. Timing couldn't be better, as I had already planned to make Frog Hollow Farm Cafe's Stone Fruit Cobbler found on Bon Appetit. There's no crust to fuss over with this fruit on the bottom, batter on the top recipe; so it's super easy to whip together. What makes this cobbler extra delicious....the almond paste added in the topping. Toss unpeeled peaches and nectarines with sugar, flour, and salt in a large bowl. Transfer to a pie plate and set aside. Preheat oven to 350°. Whisk flour, baking powder, and salt in a medium bowl. Using an electric mixer, beat butter, almond paste, and granulated sugar in a large bowl until light and fluffy, about 4 minutes. Add eggs one at a time, beating to blend after each. Mix in dry ingredients. Drop dollops of batter over fruit (batter will even out during baking). Sprinkle with almonds. Place baking dish on a rimmed baking sheet and bake until topping is golden brown and fruit juices are thick and bubbling, 50–60 minutes. Let cobbler sit at least 20 minutes before serving. I'm with Liz...now I can't wait to make a cobbler with almond paste! We are still getting the best peaches here in Colorado; thinking I need a case - I want to make every recipe! I am so going to make this soon! Loved the topping. Somehow my comment from this morning disappeared ... I love cobblers (and crisps, crumbles, slumps, and bettys) - there is nothing better for perfectly ripe summer fruit! My husband would LOVE the almond paste addition! Thanks for the inspiration!! I love a good cobbler and this one looks delicious. This is the perfect summertime dessert! Love the addition of almost paste in the topping. Peaches and almond go together so well! I never knew what stone fruits were before! Love it! Love the addition of the almond paste - this looks so good!! In the summer stone fruit is the best! So perfectly sweet and pairs well with just about anything! I could eat peaches all summer long and I love making desserts with them! Looks good! 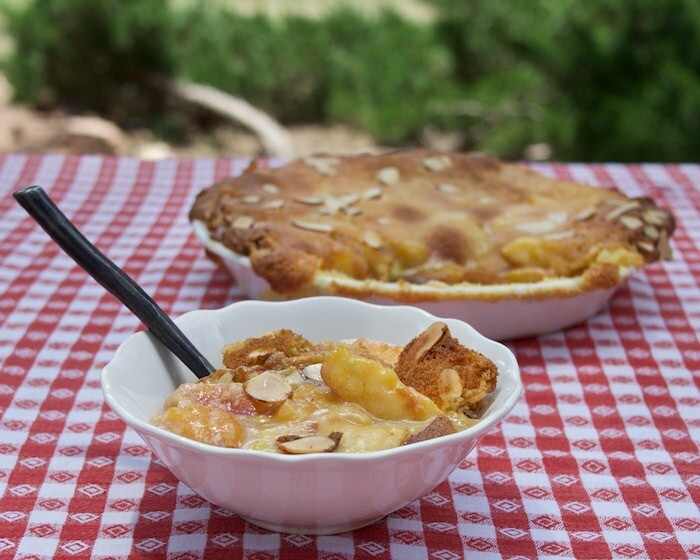 Peach cobbler is a favorite at my house, your version looks incredible! I haven't had a cobbler in years! This looks like it would be perfect hot from the oven with a scoop of vanilla ice cream! Love the almond paste in the cobbler topping. What a wonderful way to highlight stone fruits! I love these types of fruit desserts. I've been on a "crisp" kick as of late. I'll have to try this cobbler out for sure. It's been so long since I made a cobbler...time to fix that. This cobbler is right up my alley! Stone fruit is such a summer classic. Looks delicious.